The high-Tc superconductors are distinguished by their high anisotropic properties, extreme sensitivity to the stoichiometry and oxygen contents, the short mean free path, and the coherence length. The two latter points make it difficult to apply directly for those materials mentioned in Chapter 3 both the Kulik—Omelyanchouk or the BTK theory for investigation of critical Josephson current or gap structure by S-c-S weak links and the Kulik—Omelyanchouk—Shekhter theory for study of the EPI interaction. The above-mentioned theories are developed for clean (or diffusive) contacts with the size both well below the coherence length and the inelastic mean free path. Moreover, non-s-wave symmetries of the superconducting order parameter, as well as the non-electron—phonon mediating pairing mechanism are discussed by explanation of the experimental results in the high-Tc materials. 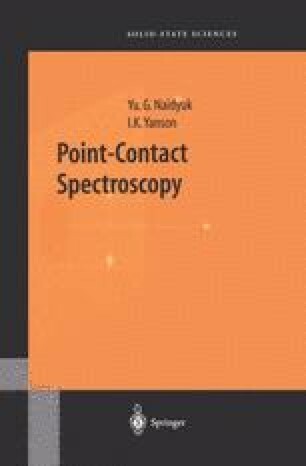 Therefore, it is not clear a priori whether it is possible to extract spectral information about the bulk properties of the high-Tc materials by the point contacts. However, as mentioned in the previous chapter (see also Fig. 12.5), the energy-resolved spectroscopy of quasiparticles may take place also for the dirty S-c-N and S-c-S contacts at some condition. The mechanism of emergence of singularities in the spectra caused by the inelastic interaction between the carriers and phonons or other quasiparticles is not completely clear. It is obviously connected with partial suppression of the superconducting order parameter, e. g., by the nonequilibrium phonons with the small group velocities (∂ω/∂q = 0) and the large density of states leading to the threshold in the excess current. The typical behavior of such phonon singularities in the spectra is their robustness to temperature change and the magnetic field rise. Contrary, the position of the superconducting features caused by reaching the critical current density for some “weak-links” or produced by the heating effects strongly depends on these external parameters, especially at temperatures close to Tc.